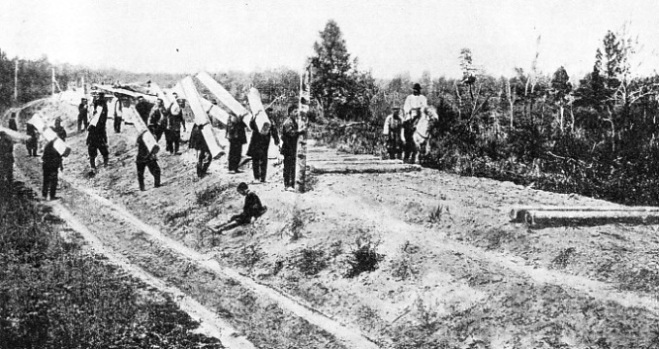 WORKERS CARRYING SLEEPERS for the new railway through the dense rolling woods which are known as taiga. This name has lent itself to the town of Taiga, a junction on the Mid-Siberian section of the line. Through the taiga the railway engineers had to clear a way for the track before it could be levelled and graded. THE vast territory of Siberia was little known and virtually undeveloped until late in the nineteenth century. The soil of that country was known to be suitable for agriculture and to have considerable mineral wealth; but without rail transport Siberian agriculture was dormant and the mineral wealth of Siberia was unexploited. There were also political considerations. Thus, several factors contributed to the importance of railway building in Russia’s great Asiatic possession. As far back as 1851 a governor of Eastern Siberia had suggested the building of a transcontinental railway. Between 1872 and 1874, during the reign of Alexander II, surveyors sent out by the Russian Government covered three possible routes for future railway lines designed to open up Siberian territory. These ran as follows (see map below): Kineshma-Vyatka-Perm-Ekaterinburg (now Sverdlovsk)-Tyumen; Nizhni-Novgorod (now Gorki)-Kazan-Krasno Ufinsk-Ekaterinburg-Tyumen; and Samara-Ufa-Chelyabinsk. Then followed a great deal of delay, aggravated by the war between Russia and Turkey in 1877-78. Despite this delay engineers in European Russia were gradually linking up strategic points along the boundary, with railways that were to prove of additional value once Siberia was penetrated. The engineers reached Orenburg in 1877, and completed a mining railway between Ekat-erinburg and Perm in 1878. They thus crossed the Ural Mountains and entered Siberia, though they were still a long way from opening up the country. 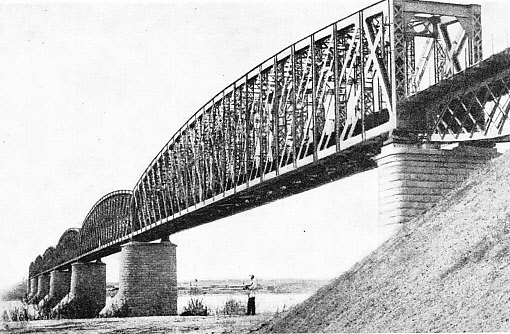 The year 1880 saw the completion of the great bridge across the River Volga, connecting the Orenburg line with the main European Russian system. Later in the same year railway builders in Siberia, helped by the Government, pushed the Ekaterinburg line forward to Tyumen. But another two years passed before anything more was done towards opening up the recesses of Siberia. Active and courageous engineers chafed at the delay; people pointed at transcontinental lines in North America, especially the Canadian Pacific, which was then attracting a great deal of attention. Under the cloud of Imperial displeasure, the Government at last allowed the surveyors to go out into the wilds, and the future route of the great highway was plotted by them across the lonely steppes, through the mountainous forest land beyond Lake Baikal, and in the farthest regions of the Ussuri country, the uttermost part of Siberia where it is flanked by the North Pacific. Far too little record has been left of the experiences undergone by those plucky men. Once they were east of the Urals they had before them an enormous stretch of country without towns, without roads, sparsely dotted with settlements which were too mean to be dignified by the name of villages, and subject to one of the cruellest climates in the world. Even then, the State backing given to the engineers was meagre. They were told to build their line as cheaply as possible. They were allowed to build a road bed thinner and more primitive than that standard in Russia, and the Russian State criterion was not then high. For their transcontinental railway they were obliged to use light rails weighing no more than 54 lb to the yard. Thus they had to build one of the greatest main lines in the world on a light branch line standard. They did their best, but years later, in the war with Japan (1904-05), Russia was to pay dearly for this false economy. From the first the road and equipment proved completely inadequate. Enormous traffic poured into the new railway, and lines of wagons were kept waiting for months on end in the insufficient siding accommodation provided. Though the present western entry to the Trans-Siberian system is effected through the Ekaterinburg (Sverdlovsk) and Tyumen line, the earliest access was from Samara in the south, whence the line reached Ufa in 1888 and Zlatoust in 1890. By 1892 this line had reached the Siberian town of Chelyabinsk, and the building of the Trans-Siberian Railway began. For constructional and operating convenience the line was divided into a number of sections, the first being the West Siberian section from Chelyabinsk to Obi (now Novo Sibirsk), on the River Ob. K. J. Mikhailovski was appointed engineer, and he and his men began operations on July 19, 1892. It was not an inviting country that they had before them, though its undulations were slight and called for no great earthworks. It consisted of steppe, covered with a high growth of grass, lightly wooded with stunted elm and willow trees, innocent of springs but boasting a number of brackish lakes, relics of the sea which, at a period geologically recent, covered this region. Through it there flowed four major rivers: the Tobol, the Ishim, the Irtysh, and the Ob, of which the first three are important tributaries. Steadily the engineers pushed eastwards with their embankment and roadbed. The embankment was essential in certain parts because of the liability of floods in the plains of the steppes, but the average height was not more than 5 feet, and the volume of soil did not exceed 23,400 cubic feet a mile. Constructional difficulties, however, were many. There was no native stone, and the engineers had to build all the minor bridges in the form of timber trestles. Even the necessary timber had to be brought to the seat of operations from immense distances, for the local dwarf trees were useless. There were no roads for the carriage of heavy material. In few places could the permanent way men dig pits for ballast. SIX STEEL SPANS carry the Trans-Siberian Railway across the River Tom, 103½ miles along the route from Obi. The river here is 1,680 feet wide, and the six spans of 280 feet rest on masonry piers. The piers are reinforced by triangular buttresses pointing upstream, to break up ice that floats downstream in winter. There was little good water, and even this was frozen solid for the greater part of the year. Artesian wells afforded a certain mitigation, though the water thus obtained was exceedingly hard, and had, in six places, to be treated chemically before it was of any use. Moreover, the water from these artesian wells, though it came from a great depth and was subjected to considerable natural pressure on that account, never came near the surface. The railway builders had therefore to bring powerful and heavy pumping machinery to each well by the best transport arrangements they could improvise. As winter closed down, the difficulties imposed by Nature increased considerably. The steppes have a short, hot summer, succeeded by a long and cold winter. The winter temperature averages - 5·8° to -13° Fahrenheit, but sometimes the mercury goes down to 58° below zero. Such temperatures are severe enough in themselves, but the builders of the line across the steppes were assailed by tremendous winds in addition. During calm weather the cold can be invigorating, for the air is perfectly dry, and less trying than the moderately cold damp winds experienced in England. But when the icy wind blows on the Siberian steppes, then is the time to take cover. There are other peculiarities. A sudden rise in the temperature, accompanied by calm, means not an agreeable change in the weather but an impending blizzard, sufficient to hide the engineers’ camp under a thick white blanket and to block the way with enormous drifts. Month after month and year after year the railway pioneers pushed on, carrying their embankment and culverts across the vast tract of the steppes. For the design of the four great bridges across the intervening rivers, Professor N. A. Bieleloubski was called in. For the first three bridges he used box girders and a uniform span of 350 feet. Across the Tobol, 170 miles from Chelyabinsk, he erected four spans over the 1,400-feet waterway. The waterway of the Ishim, 320½ miles eastwards, and 700 feet across, he overcame with a bridge of two spans. The Irtysh, 492½ miles from Chelyabinsk, demanded a bigger bridge, and six spans were necessary to cross its width of 2,100 feet. The final major crossing which the builders of the West Siberian section of the line had to make - that of the Ob - involved a waterway 2,607 feet wide. Over this, from a point about 880 miles from Chelyabinsk, Bieleloubski used the Gerber cantilever principle for his bridge, which had seven spans altogether, four of them 281 feet long, and the remaining three 486 ft 7-in long each. This was the greatest Work on the section. Track builder and bridge builder finished their task in 1896, having accomplished it at a cost of £4,042,018. On October 27, 1896, the West Siberian section, of 883 miles, was opened throughout, and the first regular train from Chelyabinsk, headed by a Wood-burning locomotive, with its huge spark-arresting chimney, steamed into Obi. While construction of the West Siberian line was being carried out, engineers under the leadership of N. P. Mejeninov were busy on the Mid-Siberian section, which was to run eastwards from Obi. This, in its turn, was divided into two subsections. The first, between Obi and Krasnoyarsk, was 471½ miles long, and the second was between Krasnoyarsk and Irkutsk, a distance of 666 miles. Thus the whole section had a length of 1,137½ miles through virgin country. The same climatic conditions had to be faced here as on the West Siberian line across the steppes, but the country to be traversed was far different, and grew more difficult the farther the railhead was pushed. On May 16, 1893, the builders started operations at Obi and began to carry their line eastwards through rolling-wooded country. The farther they went the denser the country became. There were no settlements and no clearings. As they progressed they had to cut their way through the miles of forests before levelling and grading the track. These endless Siberian woods are known as the taiga, a name which they give to one of the towns on the way. The town of Taiga was made the junction for an important branch line leading to Tomsk, which lies some way off the main track. 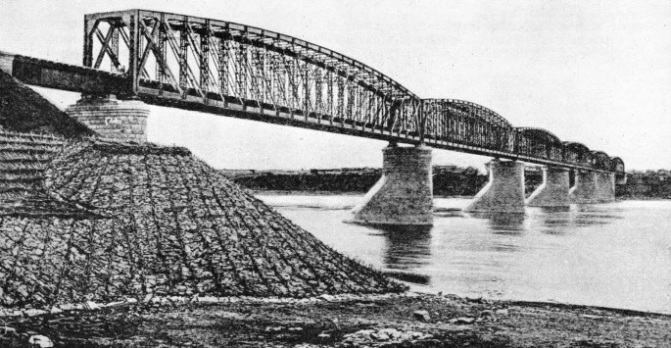 BRIDGING THE RIVER YENISEI was one of the biggest tasks in the building of the second subsection of the Mid-Siberian line. Professor L. D. Proskouriakov was responsible for the bridge, which has six spans, each 474 feet long, of steel girders. The bridge is at Krasnoyarsk, where the Yenisei is normally 2,800 feet wide. Lack of materials delayed the work for some time, and when masonry piers were set up in winter they had to be protected from the cold by wooden sheaths until the concrete and mortar had set. On the Obi-Krasnoyarsk line a large number of bridges and culverts had to be built, especially on the final hilly stretch, 107 miles long, from Achinsk to Krasnoyarsk. Six of the bridges were built of timber on a masonry foundation. There were also four more ambitious structures to be erected over the chief rivers of the district. The first of these encountered by the engineers going east from Obi, 103½ miles along the route, was the River Tom, farther down which Tomsk is situated. This river was overcome with six steel spans, each of 280 feet, across the 1,680-feet waterway. For the laya River, 181½ miles towards Krasnoyarsk, two 175-feet spans sufficed, and four similar spans were thrown across the Kya, some 56½ miles farther on Finally, a little over 360 miles east, the engineers met the Chulym, across which they threw two spans of 280 feet and one of 350 feet. Although the designers of bridges along the route of the Trans-Siberian Railway had to adopt the simplest forms compatible with durability, they were still obliged to incorporate a number of special features. They had to make full allowance for the expansion and contraction of the girders under climatic extremes, and to reinforce the piers against floating ice. For the reinforcement of the piers they introduced triangular buttresses pointing upstream, on which the ice broke and divided, instead of piling up and causing serious damage to the structure as a whole. Apart from the bridges, too, the going was generally heavy through the undulating taiga, and when completed the line had ruling gradients of a little under 1 in 66. Those responsible for the Obi-Krasnoyarsk line completed their task in 1895, and a provisional train service, mainly for the benefit of the pioneers themselves, was inaugurated on it on December 13 of that year, nearly a year before the opening of the West Siberian line. From the first Krasnoyarsk has been a centre of supreme importance, by virtue of its position on the Yenisei River, which flows out into the Kara Sea, far to the north of the Arctic Circle. The Yenisei is some 3,300 miles long, and is navigable for steamers right up to Krasnoyarsk. To-day there is considerable traffic on its waters, considering the country through which it flows, and in the ‘nineties the builders of the Trans-Siberian Railway cut off as they were from through railway communication with the west, found in it an invaluable waterway. In the depth of the winter of 1894, the steamship Stjernen, commanded by Captain Wiggins, and carrying material for railway construction, sailed up the Yenisei to Krasnoyarsk, having made the terrible passage of the Kara Sea without accident Wiggins sailed alone, not in a convoy, and there was no State icebreaker to guide him through the North-East Passage, such as is found to-day. On his return trip, he was wrecked in the Yugor Strait, between the Kara Sea and the Barents Sea, but there was no loss of life, and in the following year the brave skipper led another expedition bearing steel rails from Tyneside to Krasnoyarsk. While the first subsection of the Mid-Siberian line was in progress the engineers began work on the second subsection, beginning operations on June 23, 1894. The first big task was the spanning of the Yenisei. Professor L. D. Proskouriakov was responsible for this. The river at Krasnoyarsk is normally 2,800 feet wide, and the designer produced a simple structure of steel girders containing six spans each 474 feet long, the height above low-water level being 65 feet. All the major bridges on this stretch were delayed by lack of materials, and in some instances those responsible for the track had completed long stretches of it on either side of the river before the gap was ready to be filled in. Where masonry piers were set up during the winter months, the builders had to protect the unset concrete and mortar from the intense cold by huge wooden sheaths as they progressed. Sometimes they even kept the sheathing artificially warmed. THE TRANS-SIBERIAN RAILWAY SYSTEM starts at Chelyabinsk, in the Ural Mountains, although access to the system from the west can now be effected by the line through Sverdlovsk (formerly Ekaterinburg) to Omsk. On July 19, 1892, operations began on the first, or West Siberian section, of 883 miles, from Chelyabinsk to Obi (now Novo Sibirsk). This section was completed on October 27, 1896. Meanwhile, engineers had started to build the Mid-Siberian section from Obi to Krasnoyarsk and from Krasnoyarsk to Irkutsk, a total distance of 1,137½ miles through densely wooded country, or taiga, and undeveloped territories. On January 13, 1899, the first through train from the West steamed into Irkutsk. The route was completed in further sections to Lake Baikal and Vladivostok. The building of the Chinese Eastern Railway from the frontier station of Manchuria (now Manchouli) to Vladivostok through Harbin made possible a through route from West to East. Later an all-Russian railway route was completed. This went round the north of what is now Manchukuo. The whole of this second part of the Mid-Siberian line was beset by difficulties in construction. It was a problem to obtain subcontractors; stay-at-home Russians fought shy of Siberia, a country they did not understand, and Siberians in their turn knew nothing about railways. The country to be traversed was formidable, being mountainous and covered with the inhospitable woods of the taiga. Those who carried the way forward had to chop their path, through every yard of the projected route. The forest was diversified by the spurs of three considerable mountain ranges, those of the Altai, the Alataou and Sayan groups, and it was crossed by great rivers. Through this dark-green Waste the engineers forced their way, as long winter followed short summer, and belated spring followed winter. Among the larger bridges of the many they had to build were those over the Ouda and over the Oka, 822 and 985 miles respectively from Obi. The Ouda bridge had two spans of 350 feet and two of 280 feet across the 1,260-feet waterway; that over the Oka crossed a waterway 1,540 feet wide by two 350-feet spans and three of 280 feet. By 1898 the engineers had completed most of the Mid-Siberian line, and were running over it a service of five trains daily in either direction. Two of these trains were devoted to construction and ballasting, and a third one was for immigrants. By the beginning of 1899, Mejeninov, with his divisional engineers, overseers and navvies, had completed the whole of the Mid-Siberian section, and on January 13, 1899, Irkutsk, destined to become the metropolis of Middle-Asiatic Russia, saw the first regular train steam in from the West. ACROSS THE RIVER IRTYSH, near Omsk, the Trans-Siberian Railway is carried by a bridge of six spans designed by Professor N. A. Bieleloubski. The bridge is built of steel box girders with spans of 350 feet. The river at this point is 2,100 feet wide. The most important offshoot of this Mid-Siberian line, the Tomsk branch, was only a little over sixty-two miles long, but its construction was difficult. The builders had to carry their line northwards through the hilly woods of the taiga. The course was switchback, and the branch contributed thirty-seven bridges to the total of 574 built in the course of the Mid-Siberian line. Altogether the sixty-two miles took some eighteen months to build, for work was begun on it in the summer of 1896 and completed in January 1898. All this time construction work had been going on in the Far East, but it will be simplest if we treat each successive section in geographical order. The Baikal line, beyond Irkutsk, was the shortest section of all. Here the engineers simply extended the route from Irkutsk down the valley of the River Angara to the shores of the great inland sea of Lake Baikal. But for the passage of Baikal itself a train ferry was necessary. The Baikal, as the vessel was appropriately named, was built at Elswick, Northumberland, and sailed thence to St. Petersburg, now Leningrad. There she was taken to pieces and transported by train, by wagon and finally by sleigh across Russia and Siberia to Irkutsk. At Irkutsk the sections were loaded on to a river steamer and shipped down the Angara to the shores of the lake where the ship was reassembled. The Baikal was an ice-breaking train ferry, with three tracks on the main deck and a normal displacement of 4,200 tons. She was 290 feet long and 57 feet wide, with a steel hull and three triple-expansion engines giving a total output of 3,750 indicated horse-power. The transport of this vessel across hundreds of miles of steppe and taiga was among the feats of Trans-Siberian engineering. Even so, not even an icebreaking ferry steamer could maintain a through service throughout the winter, in spite of the services of an auxiliary icebreaker called the Angara. An alternative had therefore to be found. To carry the way across the frozen Lake Baikal in the depth of winter, the engineers laid the railed and sleepered track on the surface of the ice itself, using exceptionally long sleepers to distribute the weight of passing rolling stock as evenly as possible. This serious gap in the railway system was a terrible handicap to the Russian army during the war which broke out with Japan in 1904, and efforts were made to skirt the great, lake. The engineers carried their track round the mountainous southern shore, blasting away huge outcrops of rock, tunnelling through the cliffs and banking up between them. To-day this line round the southern side of Lake Baikal, brought into being by a national emergency, is the finest piece of engineering on the whole vast length of the Trans-Siberian. It was opened on January 14,1905. ENGINE SHED AND SIDINGS at the town of Taiga, the junction for the branch line to Tomsk, sixty-two miles away. This branch line, though short, involved great constructional difficulties. Thirty-seven bridges were built along the line, which was completed in January 1898. On April 11, 1895, a start was made with the Trans-Baikal section. 686½ miles in length, which was to carry the route into far-thest Asia. It stretched to Sryetensk, on the River Chilka, with a branch to the Chinese frontier to join the Chinese Eastern Rail-way, which Russian engineers later built across Manchuria to link up with the port of Vladivostok. This branch had a total length of more than 215 miles. East of Irkutsk, a radical change took place in the location of the line. The last part of the taiga had indeed been mountainous, but now great crags were encountered by the plodding engineers. In the short stretch down from Irkutsk to Baikal alone they had had to build no fewer than ninety bridges and culverts. Eastwards from Baikal, A. N. Pouchetchnikov undertook the planning and building of the line, first following the shores of the lake for thirty-three miles and then striking up through the Selenga Valley, crossing the pass through the Tzazan Da Mountains within 138 miles of his starting point. The climate was appalling, with temperatures down to 92 degrees of frost at times, yet without snow. All watercourses except the largest rivers were frozen hard for a large part of the year, and the subsoil was perpetually frozen below a certain level, so that continuous blasting became necessary. Roughly half-way up to the summit the engineers had to cross the Selenga River, 1,680 feet wide at that point; the bridge had six spans of 280 feet each. A TRACK GAUGE OF 5 FEET and a generous constructional or loading gauge make possible the building of exceptionally tall locomotives in Russia. A Russian engine may be built to a height of 17 feet from rail-level to chimney top. The 2-6-2 locomotive at the head of the train illustrated has a peculiarly Russian characteristic. This is a railed-in gallery extending from either side of the cab round the smokebox. The 5-feet track gauge is peculiar to Russia and to some bordering countries formerly Russian. Through running from other countries is therefore impossible, but within the Soviet Union enormously long through train journeys are possible. CONSTRUCTION TRAIN, drawn by two wood-burning locomotives, with a trainload of materials for the laying of the Trans-Siberian Railway. The train is crossing over one of the early types of bridge used for spanning smaller waterways. In the Mid-Siberian section of line alone 574 bridges had to be built. The course lay over the Yablonoi Mountains to Petrovsk, with its great iron workings, 391 miles from Baikal, and then through the successive valleys of the Chita, Ingoda and Chilka until the end of the section was reached. In the course of the route Pouch-etchnikov built seven notable bridges, including the Selenga spans mentioned above and one of five 210 feet spans over the Nerucha, 610½ miles from Baikal. The gradients were severe, with a maximum of 1 in 57·5, though 1 in 107 was a fairer average for much of the line. Altogether the builders of the East Siberian or Trans-Baikal section of the line threw up 27,764,994 cubic yards of earthwork. 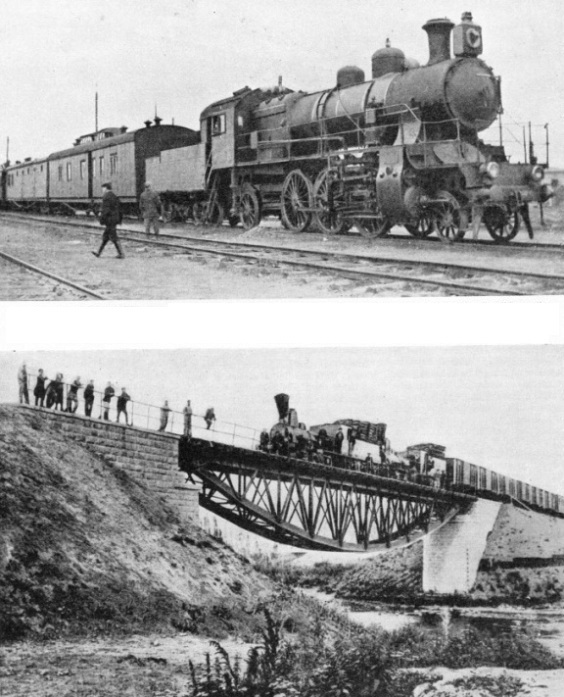 In addition to the seven principal bridges on the main line they erected three large structures on the Chinese frontier branch, over the Ingoda, the Onon and the Boroia. They completed the section by July 1900. 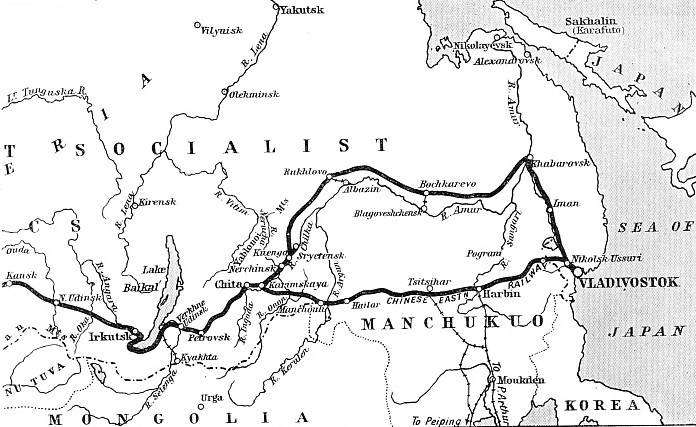 Though the Trans-Siberian Railway proper now passes round the north of Manchuria (Manchukuo to-day), and never leaves Russian territory, the first through service between Russia and the Far East involved the crossing of Manchuria. This service was inaugurated on January 13, 1903.
the Eastern Gobi Desert, however, the going was arduous and the climate terrible. The final link in the all-Russian route joined the East Siberian section of the Trans-Siberian Railway to the Ussuri line running northwards from Vladivostok. On the Ussuri line Russian engineers had begun work in May 1891, first under A. J. Oursatti and then under O. P. Viazemski. They had a strange district to penetrate, half temperate and half tropical in aspect. 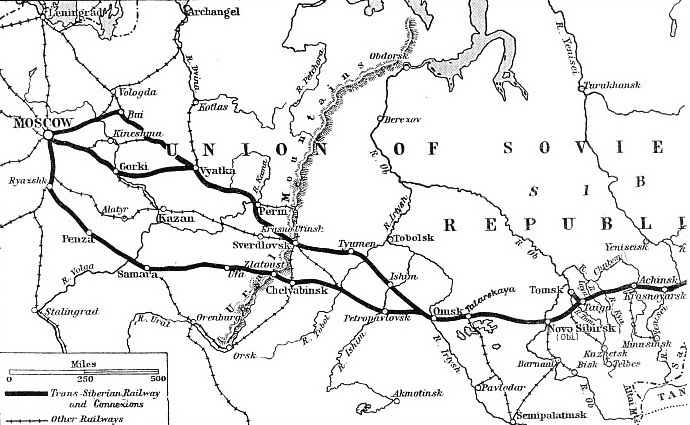 The Ussuri line, 721 miles long, was open for traffic by November 9, 1901. Having established through communication between Moscow and the Far East by the Chinese Eastern connexion the Russian Government felt inclined to rest on its laurels. It was not until after the disasters of the war with Japan, which were aggravated by insufficient transport, that the Russian Government allowed its engineers to fill up the gap between the Amur and Ussuri lines, giving through communication on purely Russian territory. Thus, in spite of all difficulties the engineers carried their steel highway across the greatest stretch of unbroken land in the world, bringing Japan within less than three weeks of England and making it possible, as was boasted at the time, to travel round the world within a space of thirty-three days. 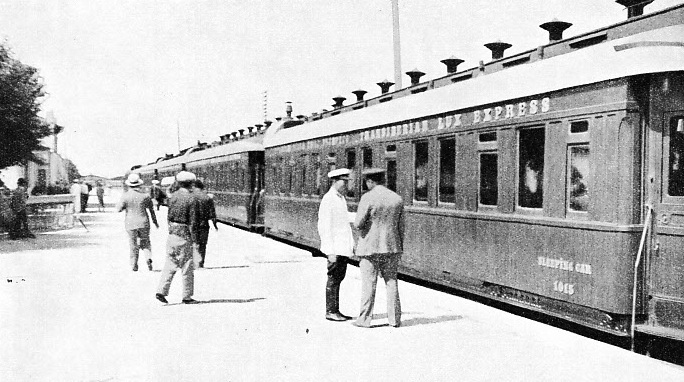 A TRANS-SIBERIAN EXPRESS at Manchouli, the frontier station between Manchukuo and the Soviet Union. The journey from Moscow to Vladivostok takes about ten days. Before the Russian Revolution of 1917 the sleeping cars were supplied by the International Sleeping Car Company but now the rolling stock is under the direction of the Ways and Communications Commissariat. You can read more on the “Trans-Siberian Express” in Railway Wonders of the World.